Have a good one! See ya on Monday! See you on Monday!!! 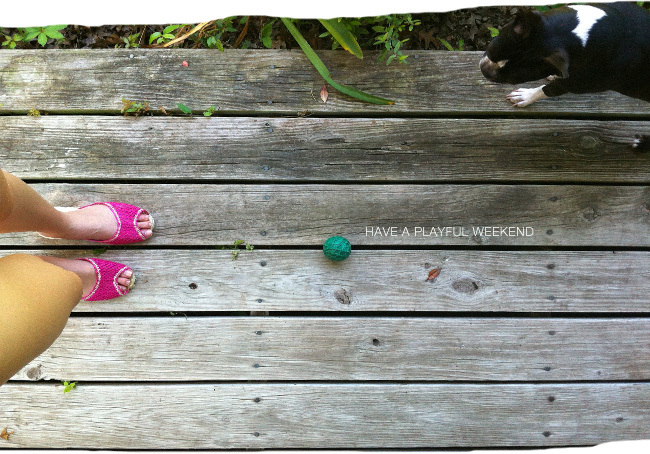 Happy Weekend to you as well! I dig the pic. Very cute. Preciosa fotografía. Me ha encantado descubrir tu blog lleno de diseño y cosas bonitas, te sigo!!! Michel and Jess: Thank you both!! Hope you had a great one also! his_girl_firday: Thank you! My dog is a little too crazy over that ball...once it's out, she WON'T leave you alone. Sonia: Thank you, dear! I WISH I were fluent in Spanish, but thank goodness I could pick up most of your words...I'll leave the rest to Google translate. :) Learning Spanish is on my list. It's such a beautiful language! Thank you so much for coming by!! Love this photo! Playful indeed!